You wouldn't know it by looking at his sculptures, but Glenn Durlacher has only been carving wood for about six years. He actually got his start in carving by carving ice for Marriott Hotels in Florida. After moving up to Albany, he came across some men carving wood and quickly realized the benefit of wood over ice-it doesn't melt! Today you can find Glenn on Route 9 in Queensbury, with an outside sculpture gallery where he can display his beautiful carvings. He carves all types of subjects, including wildlife, domestic animals, fantasy and lawn and garden art. 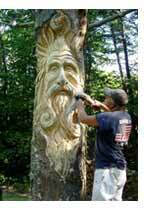 Additionally, Glenn does on-site custom carvings on trees, dead or alive. Using a variety of tools, anything necessary to get the detail required, Glenn works anywhere from one half hour to several months on his sculptures. For Glenn, the amount of time spent on a piece is not as important as "getting it right". He tries to give motion and personality to each carving, and also attempts to present the subject in its natural from and position. As for a favorite piece he's done, Glenn says he becomes "attached" to many of them, mainly because of the time spent on each, although a five-foot tall carving of Buddha does stand out in his mind. To view these beautiful and intricate wood carvings or inquire about purchasing, you can go to www.glenndurlacher.com , visit the outside gallery, the Adirondack Sculpture Garden, at 894 State Route 9 in Queensbury, NY 12804, or call 522-6025.